LAHORE, June 02 (APP): Punjab Finance Minister Dr Ayesha Ghous Pasha on Friday presented Rs 1970.70 billion budget proposals, the largest in the history of the province, for the fiscal year 2017-18. 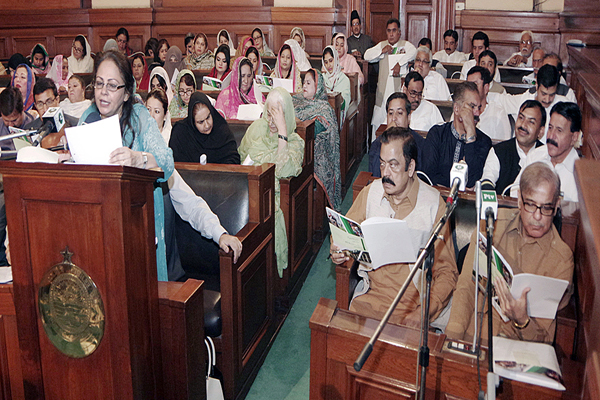 The finance minister, presenting the budget speech at the Punjab Assembly with Speaker Rana Muhammad Iqbal Khan in the chair, said that the budget for the next fiscal year has the the largest development programme amounting to Rs 635 billion, adding that it was unprecedented in the country’s history among all provinces. The development budget is 15 per cent more than the current fiscal year, the finance minister said. overcoming energy crisis and eradication of terrorism. local governments, which make up 59 per cent of the total budget. taxes and 117 billion rupees non-tax revenue. important services to the masses. provincial government of the country could introduce it. percent of the development budget for the next fiscal year. were to be spent under the old system. achieve the target of 100 percent enrollment. for the day to day needs of school councils at the public sector schools. sector schools while Rs 6.50 billion was allocated for “Zever-e-Taaleem” program in the 16 backward districts of Punjab where 462,000 girls were getting education. system under the “Khadim-e-Punjab Ujala Programme” so that education did not suffer due to problems of the grid in certain areas. enhanced to Rs 16 billion in the next fiscal year, adding that 4,275 schools with unsatisfactory performance had been handed over to private institutions through Public School Support Programme (PSSP) and the government had decided to allocate Rs 7 billion for the establishment of Punjab Education Initiative Management Authority in the budget 2017-18 to promote education through the collaboration of private sector. Punjab Educational Endowment Fund (PEEF) which would increase volume of the fund to Rs 22 billion, adding that 350000 boys and girls would benefit from the fund. separate Daanish schools for the boys and girls in Taunsa and Mankera, start of classes in Daanish school Mailsi and upgradation of current Daanish schools and Centers of Excellence in the Southern Punjab. Chief Minister’s Language Scholarship for Turkish and Chinese language learning besides other programmes. talented students during the current fiscal year while this Rs 20 billion project had promoted the use of information technology in the province. school education department in order to grant a superior status to teachers in society, adding that teachers play pivotal role in the development of societies. Non-Formal Basic Education was being increased while the details of upgradation would shortly be notified. She said the implementation of the programme would be effective from January 2018, while 300,000 teachers would benefit from the package. Punjab Finance Minister said the government had allocated Rs 263.22 billion for public health in the next fiscal budget which was 15.4 percent of the total budget 2017-18. Healthcare while Rs 73.50 billion had been set aside for District Health Authorities in the fiscal year 2017-18 budget. DHQs and THQs and provision of modern facilities for treatment. revolutionary improvement in health facilities across the province. ultrasound machines at the BHCs and RHCs in the province besides other scores of initiatives. in Murree which would cost Rs 4 billion. Kidney and Liver Institute and Research center (PKLI), adding that free treatment had already started at the health facility. 2017-18 while the government had already launched a mega project “Punjab Saaf Pani Programme”. of food authority in every city of the province to ensure safe food for every citizen. forestry and fishing and food. which various projects would be started besides subsidized fertilisers to the farmers and relief of Rs 6 billion sales tax on agricultural tubewells to the farmers. She said Muhammad Nawaz Sharif Agriculture University will be set up in Multan during the next fiscal year. wheat during the current year since the creation of Pakistan, adding that the growth rate in the produce of crops touched 4.2 percent which was way higher than the fixed target of 2.5 percent for the year 2016-17. She said the target of sowing cotton crop had also been achieved this year. adding that under the various development programmes of the irrigation department many projects will be completed including Jalapur Irrigation Project, Greater Thal Canal Project Phase II and others. of 1400 kilometers long roads in the province. which would provide succor to the rural population. Dr Ayesha Ghaus Pasha said that Sahiwal Coal Power Project had been accomplished speedily, which was the first project under CPEC completed in the shortest span of time. 1320 megawatts and start power generation in next few days. a total power generation capacity of 1180-MW would also add power in the national grid in a few days. She added many power projects including solar, hydro, Balloki, Haveli Bahadur Shah would be completed shortly and start power generation. for revolution in solar energy sector. than 670000 women had benefitted from the scheme. of the menace of terrorism. She said Rs 45 billion had been allocated for the Safe City projects in districts like Rawalpindi, Gujranwala, Multan, Bahawalpur, Sargodha and Faisalabad under the Safe City Authority. The minister said Rs 90.64 billion had been earmarked for road sector in the next fiscal budget under which the whole road network would be restored and embellished, including the construction of new roads. Bus project would be launched in Faisalabad like Multan. The minister said Rs 8.50 billion had been allocated for sports and youth affairs for the next fiscal year 2017-18.
in the backward districts of Punjab. She made special mention of the initiative for the welfare and development of women and special children in the province during the current fiscal year. She announced to fix the minimum salary at Rs 15,000. The wages of the daily wagers in Punjab would not be less than Rs 15,000, she added. Dr Pasha said Rs 1.16 billion had been earmarked for the welfare of minorities in the province for the fiscal year 2017-18 as a civilized state provided protection and rights to the minorities. She said the GST on Construction Services had been reduced from 16 percent to 5 percent from the next fiscal year. The step, she said, would help the construction industry grow in the province. The minister also announced to abolish registration fee on new business firms in the province. bonds, besides the purchase and sale. The move would promote savings culture in the province, besides spurring the investment, she added. been increased by 10 percent. allowances for the next budget 2018-19 and present its recommendations to the government.